Canon introduced three new HD camcorders to its VIXIA brand. The VIXIA HF11 (Dual Flash Memory,) the VIXIA HG21 (120GB Hard Drive) and VIXIA HG20 (60GB Hard Drive) add expanded high definition capacity at 1920×1080 resolution. 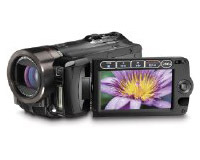 The HD camcorders also incorporate 24Mbps bit rate recording for high quality images in AVCHD format. The VIXIA HF11 Dual Flash Memory camcorder can record up to 12 hours of full High-Definition video to a single 32GB internal Flash drive. The camera can also record directly to a removable SDHC card for longer recording time. The VIXIA HG21 and VIXIA HG20 hard-drive camcorders use 120GB and 60GB Hard Disk Drives to record up to 45 or 22 hours of full HD video. The VIXIA hard-drive models also offer the option to record directly to an SDHC card. Other features of the cameras include a HD CMOS Image Sensor, a DIGIC DV II Image Processor, improved auto-focus and SuperRange Optical Image Stabilization. The camera models also come with Pixela ImageMixer 3SE video editing software, which supports Blu-Ray disk burning. The VIXIA HD camcorders will be available in September. The VIXIA HF11 (Dual Flash Memory) will retail for $1199. The VIXIA HG21 (120GB Hard Drive) and VIXIA HG20 (60GB Hard Drive) will retail for $1299, and $949, respectively.